These Chili Garlic Shrimp are incredibly easy to make, ready in less than 15 minutes, hot, spicy and so delicious! Serve these as an appetizer or as a light lunch over rice, or with a side of steamed veggies. I love shrimp which is why I have quite a few shrimp recipes here on the blog. However, a few months ago when I was making my famous New Orleans shrimp which is a favorite at my house, I realized I developed a shrimp allergy. As I was eating them, my whole face swelled up, luckily hubs was out shopping and I had him pick up some Benadryl for me. Very sad day though, because I really do love shrimp, especially big juicy jumbo shrimp like these ones. I’ve been too scared since then to try a shrimp again. However, this hasn’t stopped me from making shrimp, hubs still loves them, so I can’t deny him. I will also make some chicken at the same time though, with the same ingredients as the shrimp. So I can tell you with certainty this recipe works great with chicken breast as well. Olive oil – extra virgin, of course. Unsalted butter – I usually always use unsalted butter in my recipes, this way I can control the salt content myself. Large Shrimp – Use any kind of shrimp you have, just make sure they are not precooked. 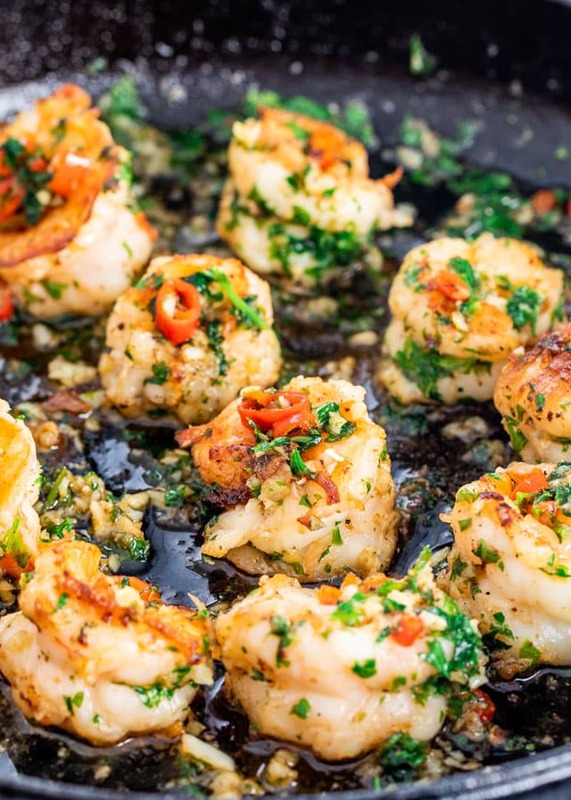 Garlic cloves – lots of it, the more the better this shrimp tastes! Chili Peppers – this dish is spicy so if you want it more mild use some red pepper flakes instead. Parsley – I love using parsley in appetizers such as this, simply because I think it makes the dish that much prettier. Salt & pepper – season with salt and pepper to your taste. I prefer to use nice big jumbo shrimp for this, however, they can be quite pricey. 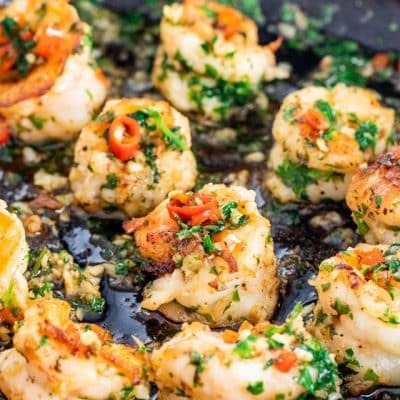 This recipe will actually work on any shrimp, however if you’re looking for the wow factor, I strongly recommend to buy the largest shrimp you can afford. If you’re using larger shrimp, make sure to devein them and keep their tails on. Most times, the shrimp already come deveined, but if they don’t just make sure to do it yourself. If using smaller shrimp it’s completely unnecessary to devein shrimp. However, you’ll find that larger shrimp have a dark, sandy intestinal tract. You won’t get sick if you don’t remove this but it’s recommended to remove this to avoid affecting the shrimp’s clean taste. First you have to peel the raw shrimp, but leave the tails on. This makes it easier to grab the shrimp when eating, plus they look fancier. Devein by making a shallow slit down the middle of the back to expose the black intestine. Using a paring knife, lift out the black vein and wipe it off on a paper towel. Rinse out the shrimp and you’re done. Mise en place (set up) – prepare all your ingredients before actually starting to cook. 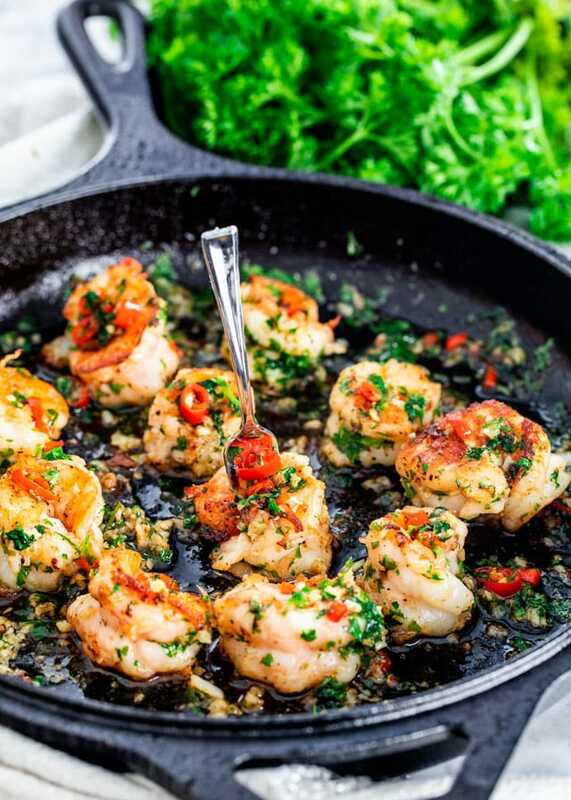 Shrimp cooks extremely fast, and you won’t have time while the shrimp is cooking to chop parsley and mince garlic, so it’s best to prepare everything before actually starting to cook. Everything should be ready so that you can just throw the ingredients in the skillet when needed. Always use fresh uncooked large or jumbo shrimp. Removing the tails is my preference because when I serve these I hate having to fight with the tails, I’d rather just pop the shrimp in my mouth and enjoy the flavors. You can usually buy shrimp that are already deveined and shelled but if you cannot find them, make sure to devein the shrimp yourself. Use fresh chilis here, if you use the dry ones, the heat levels are definitely different. Add the olive oil and butter to a skillet and heat over high heat. Add the shrimp to the skillet and and arrange. Season it with salt and pepper. Cook for 2 to 3 minutes until the shrimp turns pink, golden and crispy, then flip over and sear for another 2 minutes. Season this side with salt and pepper as well. Add the garlic, chilis, parsley and stir everything together. Cook for 30 seconds or until the garlic is aromatic. Serve warm on its own, over rice or with steamed veggies. This was great. I doubled the recipe and Isubstituted 2 tbsp of chili pepper paste because I couldnt find the chili peppers. Super easy recipe. Hi Jo! This was an easy and delicious weeknight dinner for us. Great flavors and perfect over rice! Can you use frozen cooked shrimp instead? be careful with that shrimp allergy as they tend to get worse with each exposure. I can’t even cook raw shrimp for the other members of my household any more as my son now swells up just with the cooking fumes. Love your recipes make Firecracker salmon weekly! I LOVE TRYING “NEW” things ! Simple, Fresh, tasty, easy recipes that can be made quickly ! Perfect for the working person ! 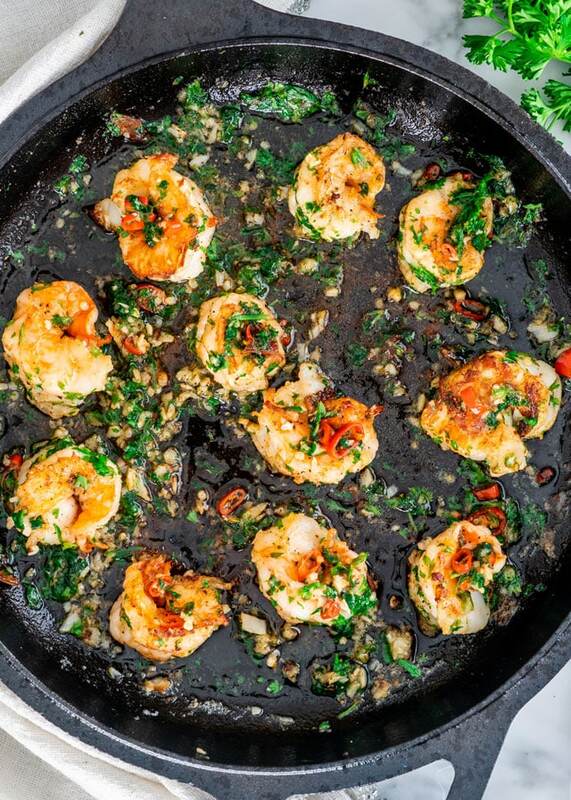 I would suggest adding a teaspoon of crushed Ginger and using Coriander in place of Parsley.